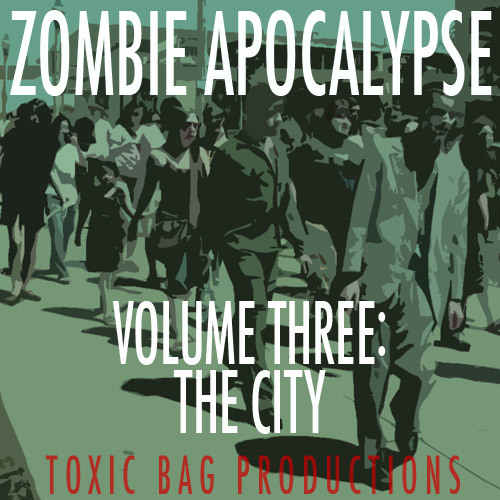 Our newest sound collection is Zombie Apocalypse Volume Three: The City. Two six-minute background ambiences set in a city that has become infested with the walking dead. Or the living dead. The ambulatory-and-kinda-bitey dead. Whatever you want to call them. They’re the slow shambly ones. Zombie Apocalypse Volume Three includes two six-minute scenes of zombie terror. Track One: The city has become a maelstrom of combat: the gunfire and explosions, the armored vehicles and airstrikes – and everywhere, the dead. Perfect for modern zombie survival games. Available at toxicbag.com and drivethruRPG.com. Our Free Sound this month is a companion to Zombie City: Zombies Attack The Car. You’ve made a break for it. You and your buddy finally decided it wasn’t safe to stay at the pub any longer, and it was time to make a run for the car. You sprint across the parking lot, dropping a few of the walking dead with your last bullets. Finally you reach the relative safety of your car. Say…you didn’t leave the headlights on, did you?